This entry was posted in Uncategorized on May 23, 2012 by Gary. 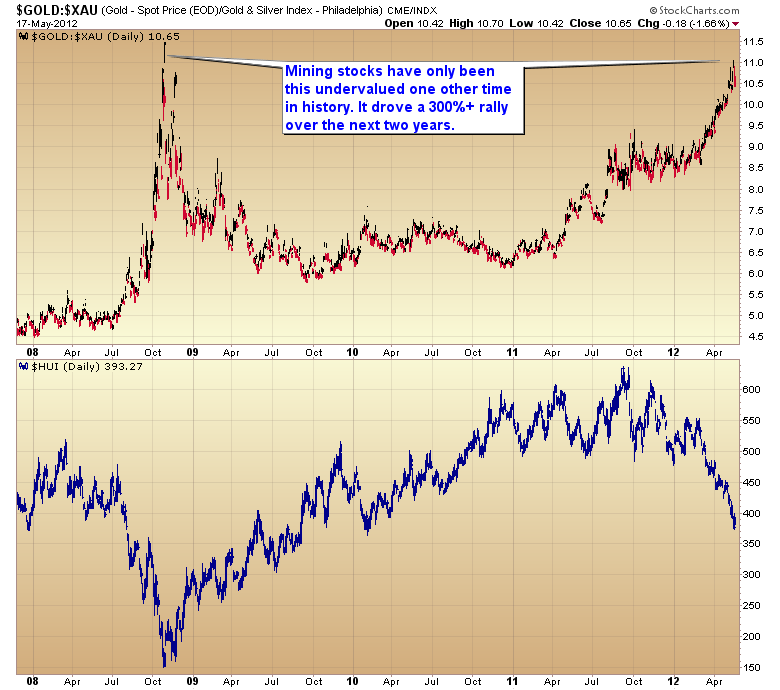 Once every year gold and stocks form a major yearly cycle low. Commodities form a major cycle bottom every 2 1/2 to 3 years. Every once in a while all three of those major cycles hit at the same time. I’m pretty sure that’s what is happening right now. The implications are that once the CRB has completed this major cycle bottom that we should see generally higher prices over the next year and a half to two years, presumably topping during a major currency crisis as the dollar drops into its next three year cycle low in the fall of 2014. I think the 30 point rally in gold today is signaling that gold has put in its yearly cycle bottom. Since gold did not break below the December low of $1523 I think we can assume that this is a B-Wave bottom and should be followed by the consolidation phase of a new C wave that should breakout to new highs either later in the fall or next spring. The next two years should generate an even more impressive advance then the 2009-2011 rally, possibly even generating the bubble phase of the bull market in late 2014 or early 2015 as the dollar crisis reaches a crescendo. As gold usually leads the stock market by a few days, we should see the stock market put in its yearly cycle low sometime in the next several days. 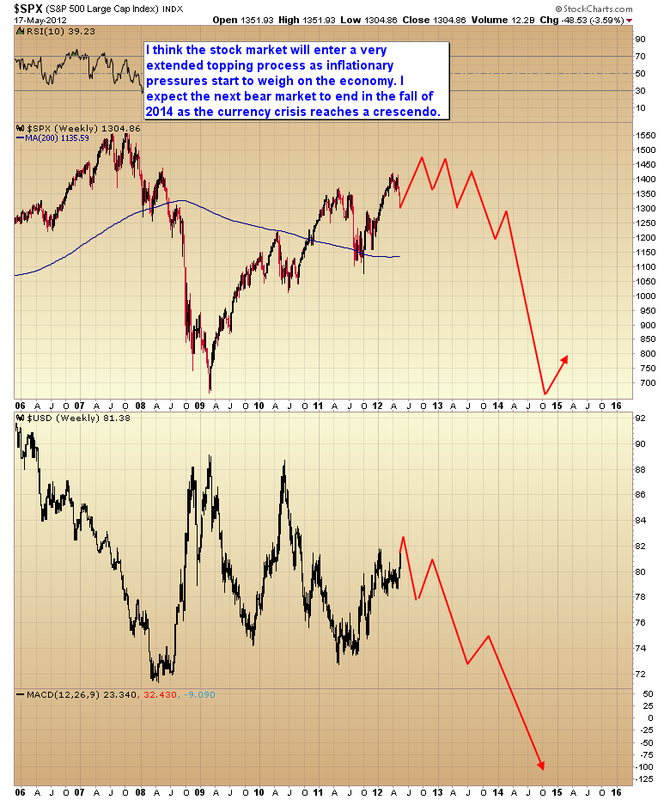 However the outlook for stocks is not as bright as the commodity sector. While I do think continued currency debasement will probably drive the stock market to at least marginal new highs I also think an increasing inflationary environment is going to compress profit margins and constrict consumer spending. After a long topping process the stock market and economy will probably roll over and follow the dollar down into that 2014 bottom. While I’m not ruling out one more quick dip below $1523 to wash out stops below that technical level, I think gold is in the initial stages of the next leg of the secular bull market. This last C-wave from 2009 – 2011 was the C-wave of silver with a 400%+ gain at the parabola top in May of last year. This next C-wave will be the C-wave of the mining stocks. During the irrational selling over the last eight months mining stocks have reached levels of undervaluation that have only been seen one other time in history. That drove a 300% rally over the next two years. I suspect we will see something similar or even larger as the market gets busy correcting this irrational undervaluation. 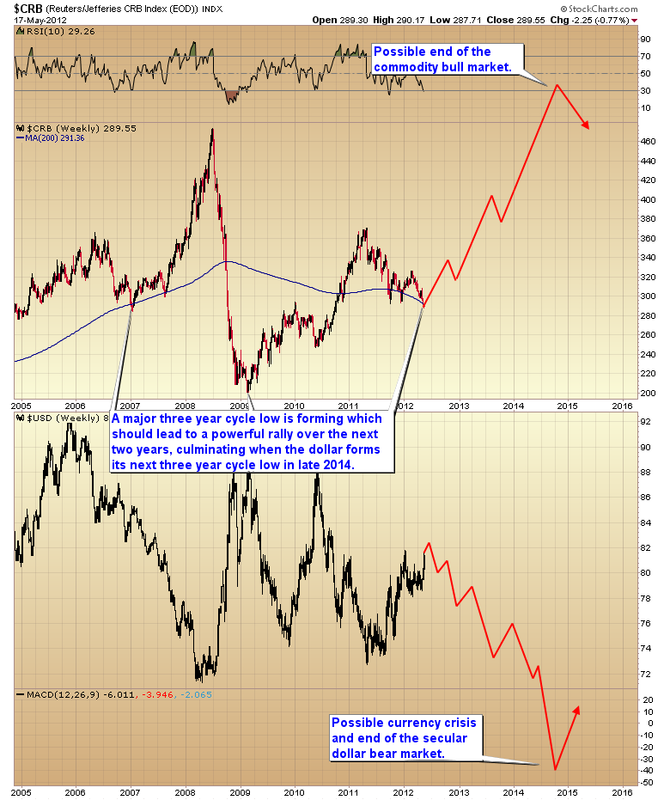 I think we are at, or very close to what is likely to be a once or twice a decade opportunity in the metals sector, especially the mining stocks. This entry was posted in Uncategorized on May 18, 2012 by Gary. This entry was posted in Uncategorized on May 17, 2012 by Gary. This entry was posted in Uncategorized on May 11, 2012 by Gary. GOLD IS AT OR NEARING A BOTTOM. I am making Monday’s premium report available to the public. 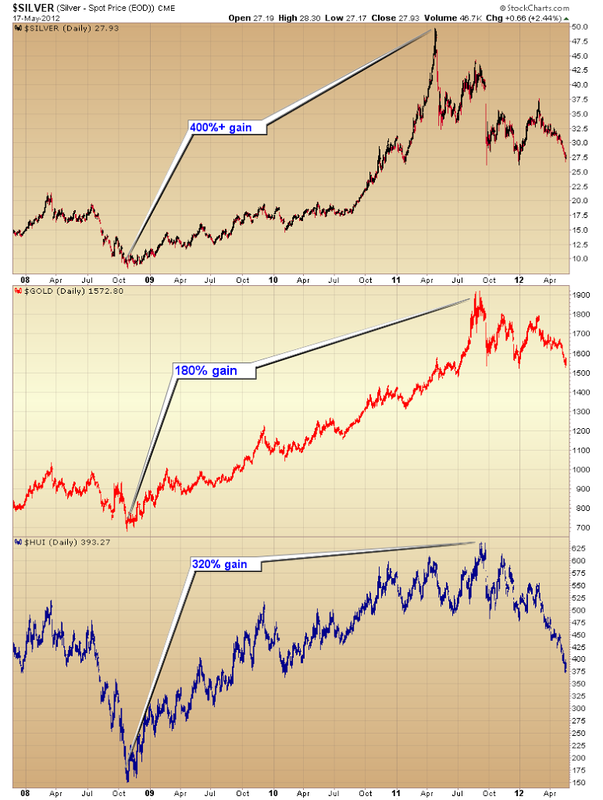 I think we are at or very close to what is likely to be a once or twice a decade opportunity in the metals sector, especially the mining stocks. If you like today’s report the $10 one week trial is still available. That includes the archives, cycle counts, COT reports, and model portfolio. I strongly suggest one read the last several weeks of reports so they understand how we got here and what is unfolding. Now on to Monday’s report. I doubt anyone is surprised by the reversal in the dollar index today. 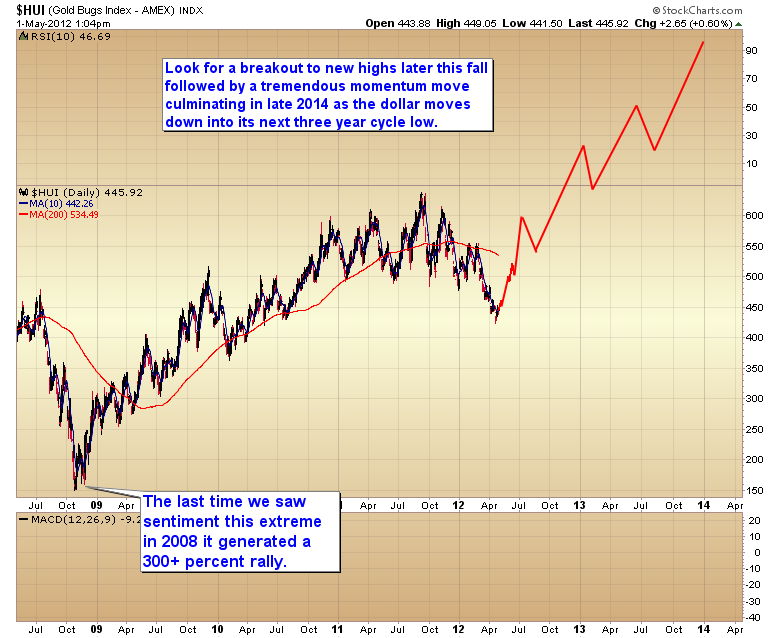 It’s been made painfully clear that Bernanke is not going to tolerate a rising dollar, at least not for very long. Cycles are still working, and still generating bounces out of daily cycle lows, but they are never allowed to get any traction before the next beat down starts. I would say there’s a pretty good chance that today’s reversal is signaling that the current daily cycle topped on day four, and the pattern of lower lows and lower highs is still intact. Presumably the dollar will now start to decline and penetrate the May 1st intraday low before the next significant bounce. The daily cycle timing bands have adhered pretty closely to standard durations in the dollar index. I don’t see any indication that has changed, so we can probably expect the next significant bounce sometime around the last week of May. If the dollar cycle has topped then the half cycle low scenario is still on the table. In this scenario the stock market is on day 19 of its daily cycle and due to form a half cycle low at any time. As most of you probably remember, I’ve been expecting an extended consolidation in the general stock market. A dollar cycle topping on day 4 and a half cycle low on day 19 would be consistent with that theory. If by some chance the dollar can recover and continue to rally for a few more days it could force stocks to penetrate the April 10th low. 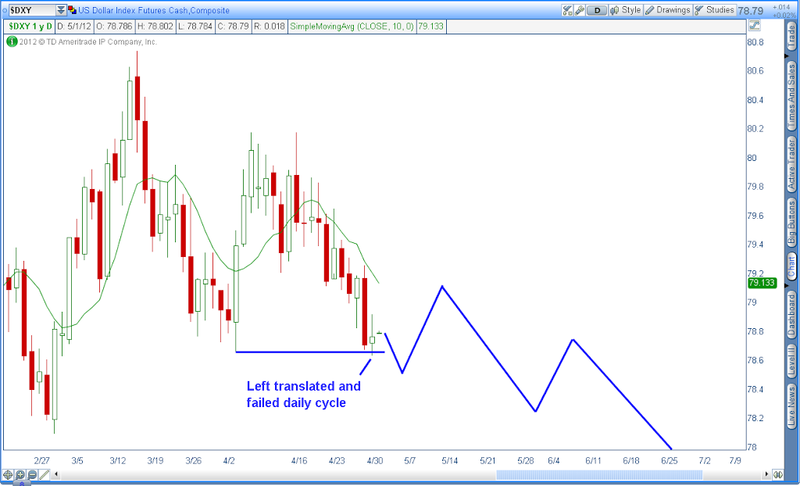 In that scenario I would re-phase the daily and intermediate cycles as shown in the chart below. At the moment I have no idea which scenario has a greater odds of playing out, although I must admit the reversal today does not look good for the dollar. In my opinion gold is trying to move down into one more failed and left translated daily cycle, which I’m pretty confident would mark an intermediate degree bottom. However, as you can see from the chart below, as soon as Bernanke broke the dollar rally gold lost all of its downside momentum. This has turned gold’s B-Wave decline into a mostly sideways consolidation for the last two months. 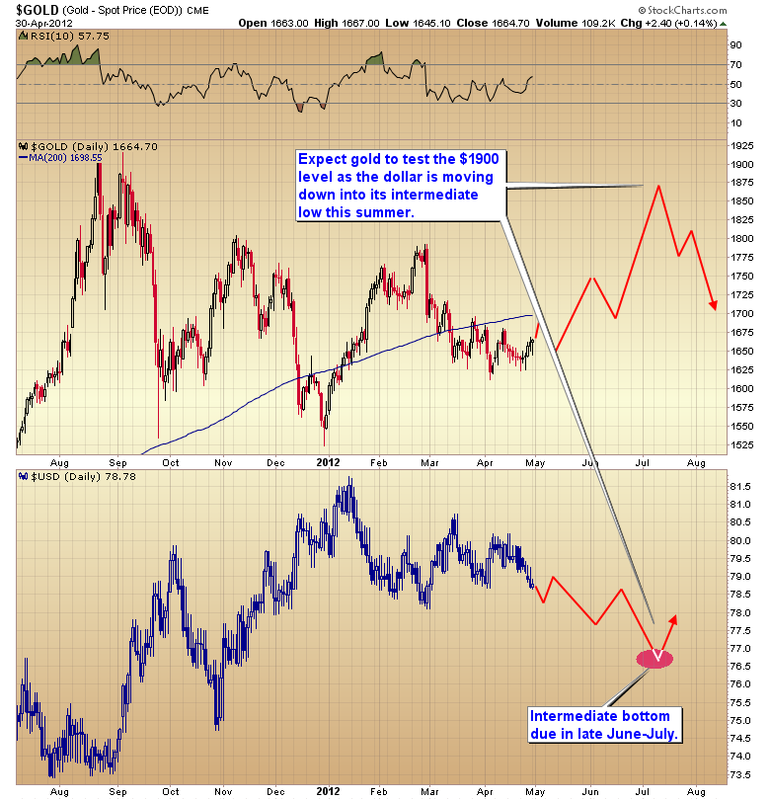 If the dollar has indeed topped then I have my doubts that gold will be able to finish its intermediate decline and penetrate the April 4 low. The fact that the current daily cycle is running out of time may indicate that we are going to have to leave the April 4 low as an early intermediate bottom. I would prefer to see gold drop down and penetrate $1612 as it would make the intermediate cycle count “fit” better. I know that’s not what most of you would like to see. Most of you probably just want the draw down to end as quickly as possible. I on the other hand understand that this is a secular bull market and that this is going to be a winning trade. (Well unless the bull market has ended ). So I’m not overly worried about a draw down. In a bull market timing mistakes get corrected. To me a move below $1612 means that we didn’t waste an entire daily cycle on a sideways consolidation and that we have all of a new intermediate cycle still ahead of us. That’s why I would prefer to see gold poke through the April 4 low. It would signal that we have more time to rally, an entire daily cycle more. So even though we weren’t able to time a perfect bottom, I’m confident that we have entered “close enough” and when the regression to the mean occurs, and it always eventually does, our mining positions are going to deliver a very hefty profit. Heck, if one was willing to just turn their computer off and wait for the bubble phase of the bull market, our current positions are probably set up to deliver a 500-1000 percent gain. Of course the cost is that you have to ignore the market and go on with your life for the next several years. When you think about it, that’s a pretty good bargain. Do absolutely nothing, and get rich doing it. This entry was posted in Uncategorized on May 7, 2012 by Gary. Interview with Tekoa Da Silva of bull market thinking.com. This entry was posted in Uncategorized on May 2, 2012 by Gary. It may not seem like much happened yesterday, but a very important event occurred. Yesterday the dollar index breached 78.65. The reason that is significant is because 78.65 marked the intraday low of the prior daily cycle. A penetration of that level indicates that the current daily cycle has now topped in a left translated manner and a new pattern of lower lows and lower highs has begun. Any time a daily cycle tops in a left translated manner it almost always indicates that the intermediate cycle has also topped. Now that we have confirmation that Bernanke has broken the dollar rally I’m confident in calling April 4th an intermediate bottom (B-Wave bottom) in the gold market. 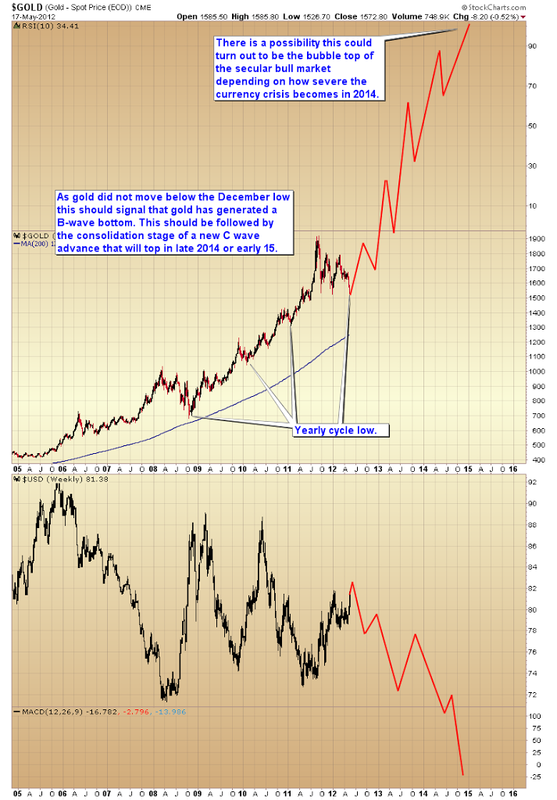 Gold should now be entering the consolidation phase of the next C-wave. I expect a test of the all-time highs sometime this summer as the dollar moves down into its intermediate bottom. That being said I have no interest in a 15% rally in gold. The real money will be made as the mining stocks exit their bear market, re-enter the consolidation zone between 500 and 600, and move up to retest the old highs. It’s not inconceivable that we could see a 30-45% gain in mining stocks over the next 2 1/2 months. Sentiment in the mining index has reached the same levels of bearishness that were seen in the fall of 2008. That black pessimism drove a 300+ percent rally over the next two years. I have little doubt this time will be any different. Now what we need to see is a change in character. We need the mining stocks to stop generating these sharp bear market rallies and transition into the wall of worry type rally that characterizes a bull market. So far that is exactly what is happening. The miners are rallying very hesitantly, and as long as this continues it will camouflage the move and keep sentiment depressed. That’s exactly what we need to happen to drive a long sustained rally back up to the old highs. The problem with the rocket launch type rallies we’ve seen over the last year and a half is that they swing sentiment very quickly to the bullish side and we run out of buyers. As long as the bottoming process proceeds gradually I think there’s a very good chance the HUI could break back above the 200 day moving average, and possibly test the 600 level by mid-July. So far all of the pieces are starting to fall in place to initiate the very early stages of what I think will eventually become another huge momentum move similar to what happened in silver and gold last year. Ultimately culminating in a parabolic blowoff top sometime in late 2014 as the dollar moves down into its next three year cycle low. Now is the time to invest in this sector as it struggles to transition from a bear market back to the secular bull trend. The time to enter is at the very beginning when no one believes. This is when the really big money is made. If you wait till your emotions give you the all clear, half the move will be over. Most traders are going to jump back into the general stock market, or tech stocks. You have to be smarter than that. The stock market, including tech, have already generated a massive move out of the October bottom. That kind of move usually leads to a multiweek, or month, consolidation. The odds of another 20 to 30% rally in the stock market are very slim. 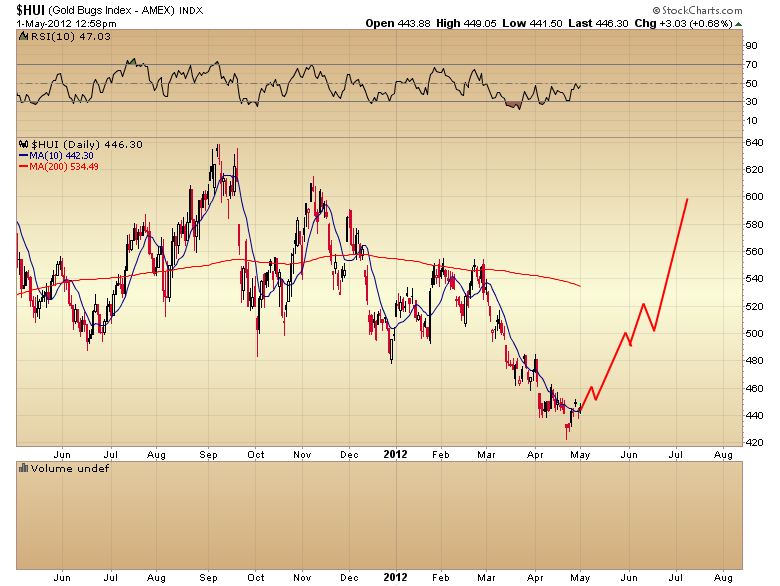 The odds of a 20 to 30% rally as the mining stocks resume the secular bull trend are extremely high. The combination of extreme downside momentum, and irrational human nature has created the kind of oversold conditions and extreme undervaluation that generates an opportunity that only comes around once or twice a decade. The $10 one-week trial for the premium newsletter will be available for the rest of the week. Click on the subscribe link on the right hand side of the homepage. This entry was posted in Uncategorized on May 1, 2012 by Gary.